Give the gift of Motorcycle Classics! We've made gift giving easy! 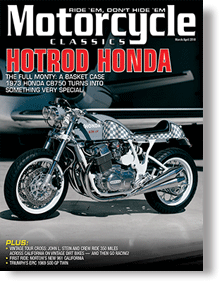 Motorcycle Classics magazine is the perfect gift for friends and relatives who truly appreciate classic motorcycles. Each issue is packed with the best motorcycle collections in the world, step-by-step restoration projects, and all the legendary bikes your gearhead loves. Each gift subscription is for 1 year (6 issues) at $24.95. Please click on +Add a Gift for each subscription.